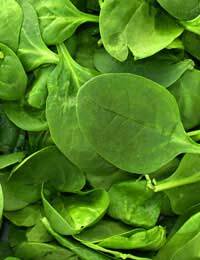 When many people think of spinach they will no doubt not put it at the top of their list of favourite foods. However, it is great ingredient to make a tasty and healthy salad that can be put together in approximately ten minutes. Here's how to make a spinach and yoghurt salad for two. 1/2 a cup of plain yoghurt. Another version of the spinach and yoghurt salad uses garlic paste and mustard seeds combined with fat free, or low fat, yoghurt. 1 cup of fat free or low fat yoghurt. First take a shallow frying pan and heat the oil. Once the oil has become hot you can add the mustard seeds. These should be fried until they start to crackle. Once this happens you should add the green chilli. Next place the boiled spinach in the frying pan and saute until the oil is separated. After this it is important to allow the contents of the frying pan to cool down to room temperature. Next take a different bowl and blend the garlic paste and salt with the yoghurt. Once the ingredients are blended mix in the spinach and serve. To really lift your spinach and yoghurt salad out of the ordinary you can add chick peas to the recipe and serve with a yoghurt sauce and cumin dressing. This will take approximately half an hour to prepare and is relatively easy to make. First place the parsley, onion and chickpeas in a bowl. Next mix the lemon juice, cumin, olive oil, zest, salt and pepper together. Gently pour the dressing over the ingredients and mix. The chick pea salad should be served on the spinach leaves and the yoghurt sauce added. 1 tablespoon of orange juice. Place all theses ingredients in a bowl and mix together.